Yes, he’s dead. Yes, it’s very, very tragic. Yes, he did make a major difference to the music scene and make people rethink what they viewed pop music as (and showed us all that money doesn’t always buy a good plastic surgeon). But c’mon guys, let’s get some perspective on this. I’d like the radio/MTV to be playing something other than his top 50 greatest hits and I really don’t care that much what B-list celebs think about his death (‘tragic’ and ‘will be missed’ are seriously overused terms). Death comes to us all, and sure it’s a shock when a public figure pops his cork, (especially if you’ve shelled out for expensive tickets) but why this mass hysteria? We saw a similar media frenzy when Jade Goody left us, and despite numerous bad Living TV re-runs and flowers equal to Diana’s departure the fact remains that DURING her life she was not the nicest person; and no, stupidity is not an excuse. 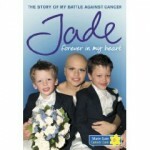 Jade DID leave behind children and of course I send them sympathy and hope they’ll do well in life- but that doesn’t make their mother a saint- as her own autobiography will tell you. Hang on, she doesn’t have just one- she has THREE- and who has that much to say by the age of 27? Honestly, people die, we grieve, such is the way of the world, and has been for thousands of years before the cult of celebrity meant that deaths were elevated into semi-religious occurrences and mourning/tributes needed to be offered to appease the great gods of TV. ‘Think of the ratings’, shouts the overlord and the minions scurry to create poor quality low cost programmes that will boost viewing figure. ‘Think of the headlines!’ thunders the latest Zeus-infused honcho and lo and behold situations are manufactured that create chaos and controversy (the Britney Spears hospital car chase anyone?). ‘Think of the products’, they thunder and out pour a wash of crappy nostalgic gifts which allow you to celebrate/mourn your idol via wiping your hand on a tea towel with their picture on it. Enough is enough people- let the dead lie silently in their coffins and the TV schedulers broadcast something other than painful re-runs and over sentimental waffle. We’re equally as guilty- if we didn’t consume all this rubbish they wouldn’t produce it, so make a conscious effort to switch channels, put on a movie and avoid #michaeljackson Twitter hashtags like the plague. We can make a difference! Dudette, it’s human nature we can intellectualize death of a public figure or figure but in the end it’s the mass of humanity who decides where and when it’s sympathy fall and the mainstream media, ( being a commercial business ‘n’ all ) will fall in line and provide the coverage for the great unwashed masses, ( I’m a full paid up member). For all the failings of the media for using this event as a by line/filler, they are giving the people what they want, Maybe the fact that Fawcett leaving her fortune to abuse shelters should have garnered more of the media’s attention than it did, but in the end the public will WILL be done, Jade Goody, Michael Jackson and the rest interest us because we see their human frailties and faults , we empathize, laugh, cry,we grow with these people and dare I say grieve. And as to “over sentimental waffle”, read below girl, love him or hate him, (I’m on the fence) the man had style.